Growing up allergic to dairy, I was always forced to pass on the swiss mix packets inevitably passed around this time of year. Even though I did not partake in the powdered cocoa packets, my love for hot cocoa was not hindered. One of our intermittent family traditions involved jumping in the car with giant thermoses* of hot cocoa and going to see the Christmas lights. In the South, we have these drive through light parks. They're typically installed in places that have multiple baseball fields or large park areas. This is just NOT a thing in California. Guess they don't have the real estate for it. If you know of one in the Bay Area, let me know! I would love to keep the tradition alive with a big jug full of this hot cocoa mix. I like making a powdered mix because it has a shelf life of 12 months. I can have hot cocoa in five minutes any time of the year! It also makes a super cute last minute gift. And, what is hot cocoa without 18,000 marshmallows!? If you've been following my blog for a while, you know I love s'mores, and I love marshmallows. The hunt for zero waste marshmallows, has definitely been a road block. Homemade marshmallow fluff is the best solution I've come up with. It's a super tasty treat! Put the powdered sugar, cocoa, and salt in a mason jar and give it a good shake! **Powdered sugar is pretty tricky to find in bulk bins, but you can easily make your own. All you have to do is blitz regular sugar in a blender. Mix the chickpea liquid with a stand or hand mixer on medium-high speed for 5-8 minutes until medium peaks form. Add in the powdered sugar and vanilla, and blend until incorporated. This mixture will only last a couple of hours before it deflates. At that point, I just store it in the freezer. I'll defrost it and rewhip when it's time. *If you want a stiffer marshmallow fluff, you will need to add cream of tartar. **You can use the chickpea liquid from a can or from dried beans. If this is your first time making aquafaba, I suggest using the liquid from a can so you can get the feel of the consistency. This is a great resource on aquafaba from Minimalist Baker. Warm one cup (8oz) of coconut milk. Add two tablespoons of he hot cocoa mix and stir until fully incorporated. Add an extra large scoop of vegan marshmallow fluff! *I make coconut milk, and really like the sweet coconutty taste it adds. Of course, you can use any type of milk you like, but I don't recommend water. If you want to add a twist, add in some peppermint extract! ***Important notes!! *** If you don't add the marshmallow fluff, you will need to add 1/4 teaspoon of vanilla extract to your drink. Vanilla actually increases the flavor of chocolate. It's often what we associate the chocolatey taste with. Without the vanilla extract your hot cocoa will taste bland. But, don't just take my word for it. "Chocolate simply wouldn’t taste like chocolate without vanilla. Chocolate tends to be somewhat dull on its own. Vanilla transforms it," says Patricia Rain, author of a new book, Vanilla: A Cultural History of the World’s Favorite Flavor & Fragrance. Another one of my holiday traditions I'd like to tackle is the making of a gingerbread house! I always bought those Wilton Kits growing up. But, I'd love to try my hand at baking the gingerbread and decorating it with all bulk candy! Would you be interested in my final creation? What are some of your favorite holiday traditions and how your keeping them zero to low waste? Y'all know how I feel about food waste. Sometimes, your bread just goes stale a little faster than you thought it would. If that's the case all is not lost! I buy bread in a cloth bag. If I'm buying a loaf, I cut it in half. I store half in my bread box and the other half in a cloth bag in the freezer. Freezing bread keeps it as fresh as the day you bought it! It will stay that way in the freezer for a couple of weeks. However, I don't think a loaf of bread would last that long in my house. Revive it: If it's not a complete brick, run under running water and microwave for 30 seconds. It will steam creating an almost fluffy bread. Crostinis: Run under running water and microwave for 30 seconds. The bread will become soft temporarily. It will give you time to slice it thinly without it breaking. Spread the pieces out without overlapping on a baking sheet. Brush the pieces with olive oil, and bake at 400 for roughly 5 minutes. They will keep in the pantry for a couple of weeks. They're perfect for dips, spreads, and deconstructed sandwiches. Croutons: MMMMmmmm yummy salads. Run the stale loaf under running water and microwave for 30 seconds. Cut it into small cubes. Brush the pieces with olive oil, and bake at 400 for roughly 5 minutes. They will keep in the pantry for a couple of weeks. And, they're way better than the stuff you get in a bag at the grocery store. Dressing: I love this side dish even when it isn't Thanksgiving! It's very easy to scale for the amount of bread you have too. Run the stale loaf under running water and microwave for 30 seconds. (Are you seeing a pattern?) You'll want to rip it into large chunks. Add your bread chunks to an appropriately sized dish. Add some sauteed onions, sage, thyme and a pinch of salt and pepper. Slowly add in vegetable stock. The bread should absorb a good portion. Once you start to see it creeping up the sides of your dish, you know you've poured enough. You don't want your chunks swimming in broth. Just enough broth so you know it's there. Bake until golden brown at 375 degrees should take around 45 minutes. Whisk half a dozen eggs with 1/2 a cup of milk. You can throw in any toppings you like cheese, sausage, onions, or veggies. Bake at 350 for an hour. The casserole should be firm. Whisk 2 eggs and 3/4 a cup of milk and 2 tablespoons of melted butter. Pour into the mason jar and let sit overnight or several nights. Pour onto a baking sheet and bake at 350 for 20 minutes. 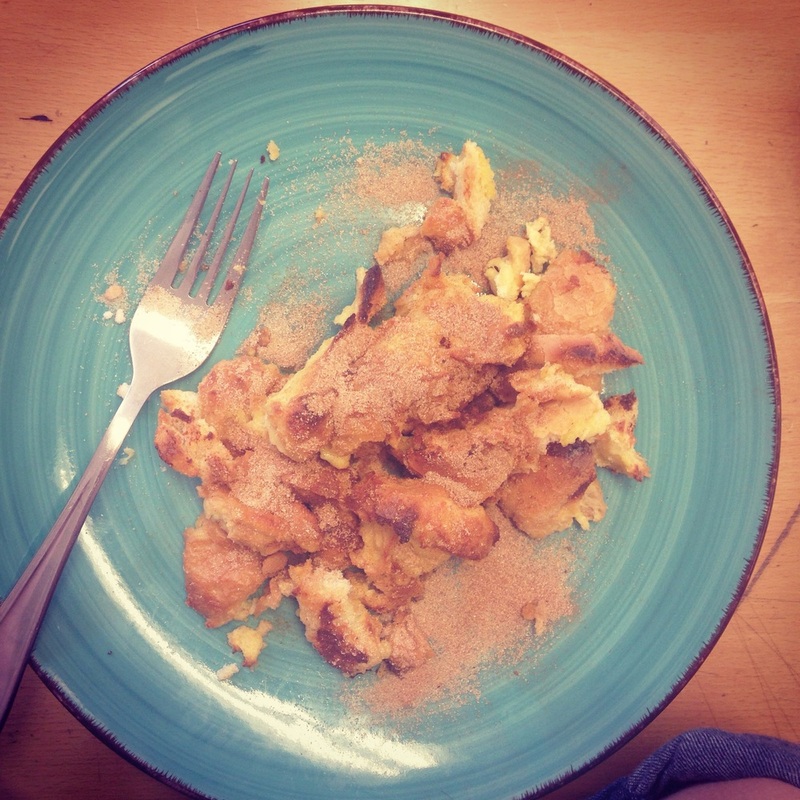 I always use the toaster oven at work, and then I sprinkle with lots of cinnamon sugar! This is me at work, chowin' on some delicious french toast! It's warm and crusty and sweet and a perfect way to start the day. What's your favorite use for stale bread? Growing up our one, yes one and only, Christmas tradition was to bake cookies, listen to classic crooner Christmas music, and put up the tree after Thanksgiving. I’m bummed; because, we don’t have room for a tree this year. There will be room next year! We’re just renovating part of our house and furniture is crammed every which way. 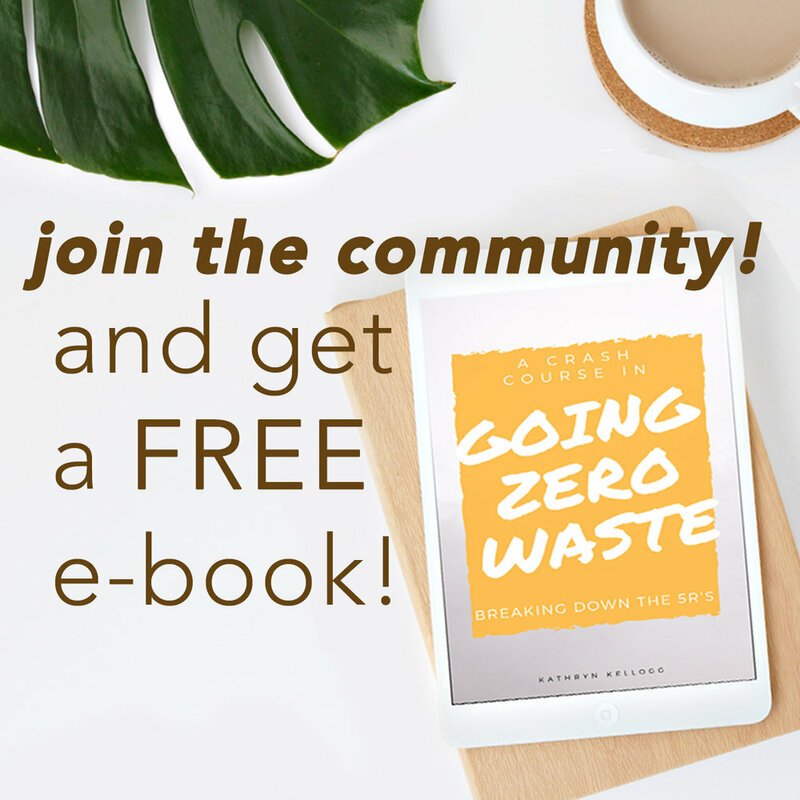 (Zero Waste reno post to come!) So, this year it’s just baking cookies and listening to Christmas tunes. Armed with an arsenal of Bing Crosby, a sleek marble rolling pin, and Mom’s perfect metal cookie cutters - I’m ready for action. But, what about food coloring? The best part of making cookies is all of the colorful icing and the freedom to decorate! 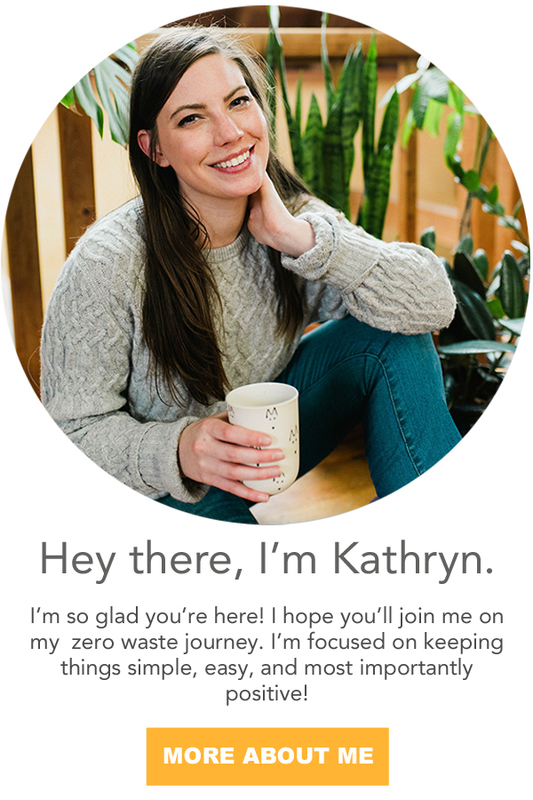 I had no idea how I was going to do this zero waste. I really didn't want to buy tiny plastic bottles of artificial dye. Then I started thinking what is food coloring? Apparently it's made out of crude oil. Seriously. Same stuff that makes - you guessed it - plastic. They are made in a lab with chemicals derived from petroleum, a crude oil product, which also happens to be used in gasoline, diesel fuel, asphalt, and tar. NPR.org: “Artificial food dyes are made from petroleum and approved for use by the FDA to enhance the color of processed foods. Great news the solution was staring me in the face. Quite literally. On my spice rack. I had all of the makings for a tasty and festive occasion right in my kitchen! I’m sure I’m not the first person to think of this, but I felt like a genius for a hot second. Now all that’s missing is friends and adult drinks! Shauna from Zero Waste Teacher joined me and Bing in the kitchen for a festive night. She taught me how to make some amazing coconut milk which we used in our cookie extravaganza. Cream together the butter and sugar. Add the sweet potato and vanilla extract and coconut milk stir until smooth. Add the dry ingredients and mix until well incorporated. Sprinkle flour on your work surface and turn out the dough. Roll it till it’s approximately 1/8” thick. Cut out fun shapes, place on a baking tray and pop into the freezer for around 10 minutes. Cream together the butter and powdered sugar. Add one tablespoon of milk at a time until it’s creamy. You can make it as stiff or as loose as you want. This recipe is pretty medium. After it was made we divided it into three bowls. The first we added 2 teaspoons of turmeric. The second we added 2 tablespoons of beet juice, and the third we left white. For green dissolve 2 teaspoons of matcha in a tablespoon of water. Pro Tip: You can make powdered or confectioners or icing sugar by blending regular sugar until it’s fine. How cool is that? Have you used natural dyes? What are some of your favorite Christmas traditions?